Now many of you might think of PNG as a hot tropical place and yes it is, but it is also a cold and wet place too. Here in Ukarumpa we live at just over 5,000ft and even though we are only a few degrees south of the equator it still is cold. June, July and August are the “winter” months here in PNG and up here at 5,000ft it can get chilly. Thus we have a fireplace for heating our house. Some people here don’t have them and if you go to their home you remember to wear long pants and bring a sweatshirt. So now that the weather is cooling down (what I mean is it might get to 50 degrees at night) we are stocking up on fire wood. 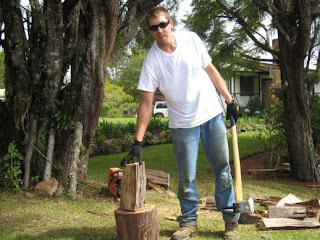 We have been just buying it from our local store here, because the wood I got for free turned out to be a bunch of work to split with an axe. So about every month or two we buy about five logs and on a Saturday I spend a couple of hours cutting and splitting it and stacking it under the house. It is nice that it doesn’t take too long to do, but buying wood every couple of month’s means our wood is always wet. Since we are just renting our house we don’t have any great place to store lots of wood to get it good and dried out before using it. However, I have gotten pretty good at building fires to get our house nice and warm. 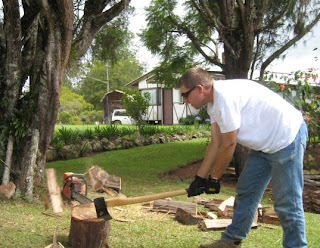 Whats that chain-saw doing in the background! Thats cheating!